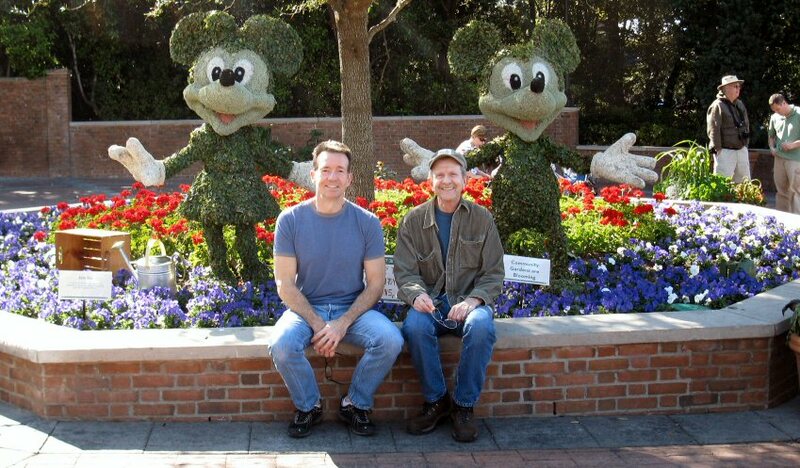 Recently, George – my trusty partner in crime and dining – and I made an excursion to the 17th annual Epcot® International Flower & Garden Festival, with an appearance later that evening at Gallery Q in Orlando for the opening of artist and friend Keith Theriot and three other talented local artists entitled “Our Tribes”. 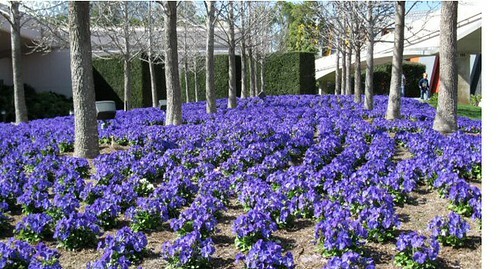 From garden to gallery, it was a splendid day. Unlike our visit to the Epcot® Food & Wine Festival, where George and I just ate our way around World Showcase (twice), our excursion to the Flower & Garden Festival is actually something that’s kinda sorta related to the overarching theme of “Live from the Lizard Lounge”, as both the festival (totally) and this blog (partly) are about flowering and gardening. 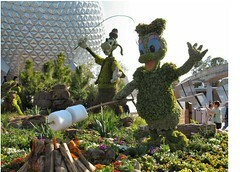 Above and beyond its usual botanic splendor, the park is particularly awash with agronomical grandeur during the festival, with lusher-than-usual planting beds and Disney character topiaries arranged throughout in whimsical themed tableaux, courtesy of partners Mother Nature and the Disney horticultural team. Additionally, guests at the festival can hear and see demonstrations by various gardeners of note and horticultural specialists on topics ranging from successful herbal gardening to creating backyard water features. In fact, I’ve already made plans to return the weekend of May 14-16 to hear Ahmed Hassan, host of HGTV’s Yard Crashers, present information on landscaping. 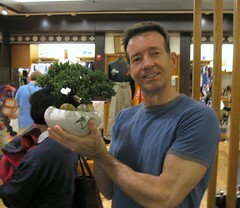 As always, George was on the prowl for a new bonsai (don’t ask – it’s an obsession with him). 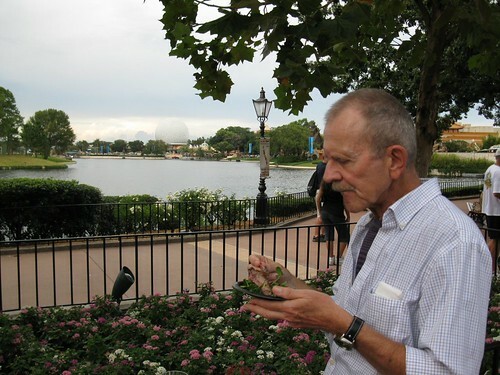 To that end, we stopped at a couple of kiosks on the World Showcase promenade and interviewed a few bonsai, but none of them fit the measurements of the plant stand that would be its home in George’s apartment or his strict standards for poise and appearance. 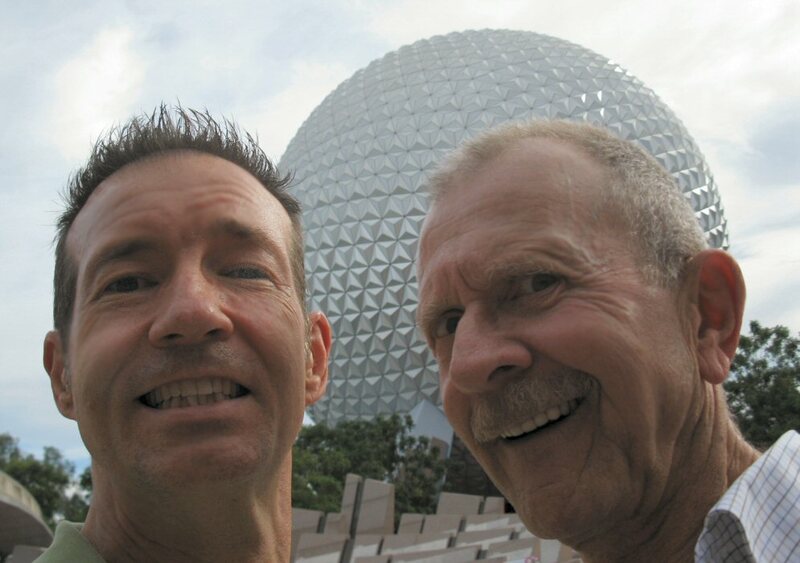 All of the Cast Members who work in the international pavilions in Epcot® are actually citizens of the sponsoring country in the U.S. on a one-year work Visa. The beautiful young Japanese women who assisted us were pleasant and helpful with lovely names (at least they were lovely to me, citizen of a country where girls are named Tiffany and Apple). 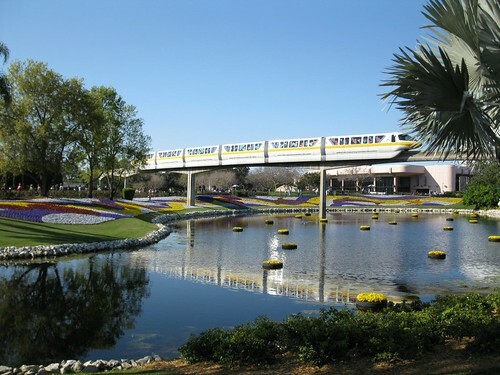 “Saori” rang George’s purchase up while “Nikona” deftly packaged the plant securely in a cardboard box and then in a double bag so that it would survive the rest of the evening in a crowded theme park with as little stress and damage as possible. In other words, it was heavy and ungainly and George and I were the ones stressed and damaged after spending the rest of the trip around the promenade taking turns toting the bulkily bundled bonsai. After stopping along the way for a few good unobstructed shots of some of the neat topiaries (my favorite being Daisy Duck toasting a giant marshmallow on a stick over a campfire), we left the festival to enjoy a filling dinner and then wended our way to Keith’s art opening in downtown Orlando. 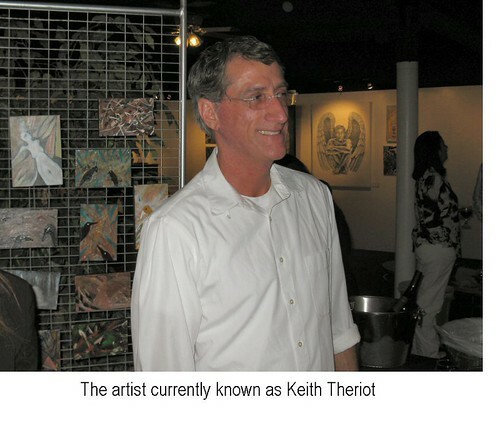 Keith is a très talentueux artiste (and equally talented at envisioning the best way to hang and display art at a gallery), and this particular showing at Gallery Q was no exception. The four artists represented at the gallery displayed a captivating diversity of styles, and the eclectic crowd of supporters and art aficionados had both an artistically edifying and socially enjoyable evening. Afterward, I hung around for a bit to help the artists clean up the tons of spent wine glasses and leftover hors d’œuvres – all of which they themselves prepared and provided. To quote Stephen Sondheim, “Art isn’t easy.” But it certainly was stunning. 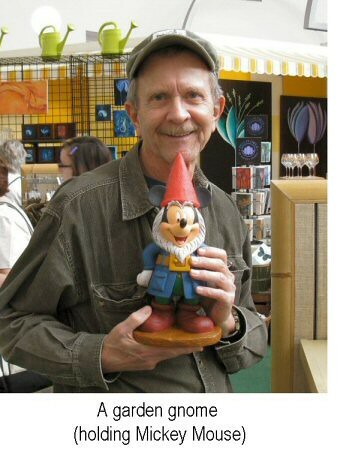 Ah, my dear friend George – renaissance man, indefatigable shopper, and pastiche poet. Thanks to him, there are way too many songs I can no longer sing without giggling as I remember his comically penned version of the lyrics. From his original classic, “Ode to Halcyon” (sung to the tune of “I Feel Pretty” from West Side Story) to his “A Brief but Passionate Paean to Vicodin” (sung to the tune of “I’m in Love With a Wonderful Guy” from The Pajama Game), he has been twistedly rhyming his way into my fragile psyche for the past 10 years. I promise to feature these and more in future posts (unless WordPress cancels my account in retribution). Make my arteries very hard. Nosh until I think I’ll drop. When they’re gone I’ll wipe out all the candy. Rudolph the red-nosed reindeer, had a very tiny nose. And if you ever saw it, you would say it hardly shows. All of the other reindeer used to laugh and call him Schnoz. That is, ’til Rudolph blew it, sliming every inch of Clause. Santa couldn’t find his sleigh, under all that reindeer snot. Fired for his nasal actions, as the other reindeer cheered. Now Rudy lives in Phoenix, sinuses forever cleared. George came down to spend Thanksgiving at the Lizard Lounge this year. As neither of us is a staid traditionalist, I decided to forego the turkey and rotisserie a chicken on the grill instead. 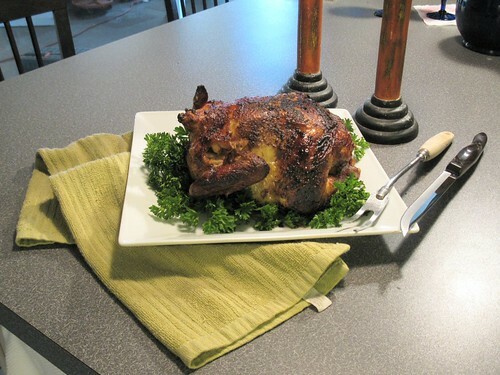 As the rotisserie process always results in a succulent and pleasing piece of poultry, I thought it would make for good blogging to share the steps. After procuring a whole chicken from your local market, be sure and remove the little packet of innards (or giblets) from inside the body cavity. I have no use for them and toss them in the garbage. (That’s purely a personal preference; do with them as you wish.) Rinse the chicken both inside and out, patting the outside dry. 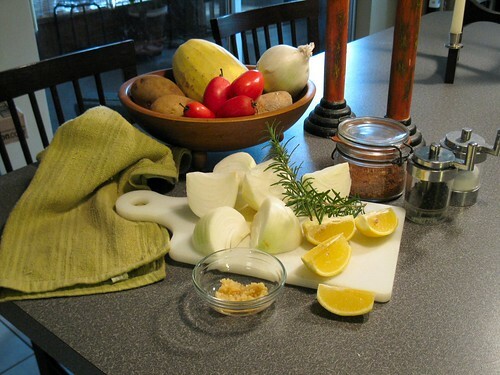 Cut an onion and a lemon into wedges to stuff inside the body cavity. For this particular chicken, I also snipped a couple sprigs of rosemary from my plant outside and chopped up some garlic to add to the mix. As the chicken turns on the rotisserie, these aromatics heat up and permeate throughout the chicken, adding to the flavor. The extra bulk of this stuffing also make the chicken a little more stable on the rotisserie spit. There’s no trick to stuffing everything inside – just cram as much as you can in there. It doesn’t have to be pretty. Insert the spit through the center of the chicken. 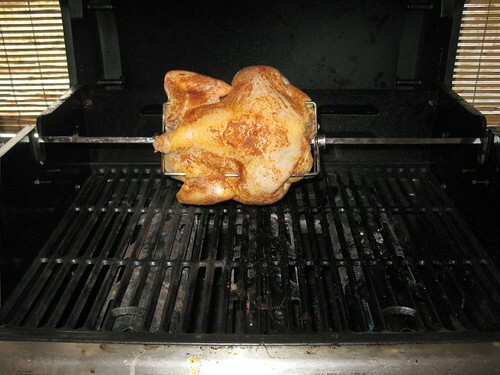 Rotisserie spits come with four-pronged forks that tighten with thumbscrews and keep the chicken stable on the spit. 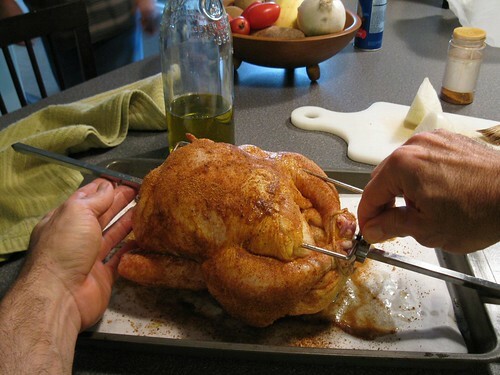 Just press the forks firmly into the chicken from both ends and tighten them up as securely as you can. Once you have the spit inserted and secured, use some kitchen twine (available at any grocery store) and tie the ends of the legs together. This helps keep the onion stuffing inside and keeps the legs from flailing about as the spit turns. 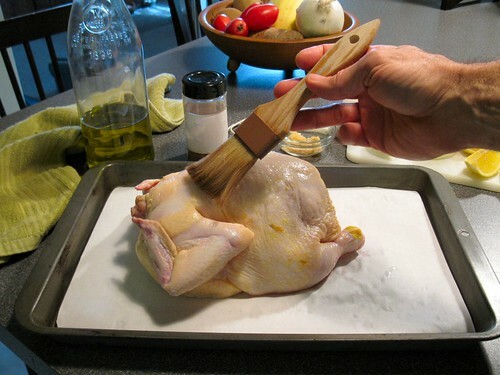 Brush the outside of the chicken with olive oil. This will help the rub to adhere better and help keep the chicken moist. 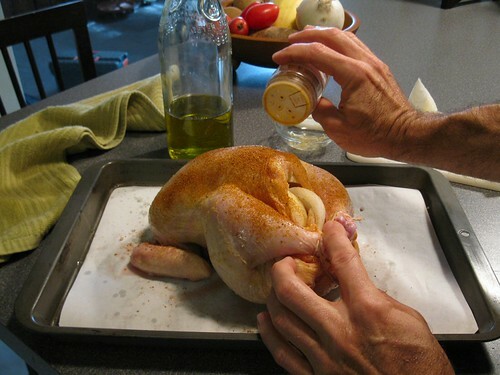 Next, sprinkle the entire bird with a good rotisserie chicken rub. You can easily double or triple these measurements and mix up a bigger batch. I keep a shaker on hand and use it on regular grilled chicken and salmon. Once the chicken is sufficiently covered in the rub, it’s time for the grill. Your rotisserie attachment will come with instructions for the proper way to use it with your grill, so be sure you follow those closely. I have a three burner gas grill that I preheat to 350° to 400°, turning the middle burner down low once I onsert the spit so that the chicken doesn’t burn. Although it will probably take from 1½-2 hours to cook, you’ll want to keep on eye on it to make sure the outside doesn’t burn. You’ll know it’s ready when a meat thermometer inserted into the thickest part of the breast registers 165°. Be sure you have oven mitts on when you take the spit off the grill, as it will be hot. As usual for grilled meat, let it rest for 10-15 minutes before carving. Although preparing a chicken for the rotisserie can be involved, the end result is always rewarding. George and I each took a half of the chicken and defiantly and unapologetically ate every morsel, sucking the bones clean. I dare say you would have done the same…enjoy! The ducks and I had a fine old time this evening. Another loaf of bread disappeared down those hungry gullets and once again I marveled at the fact that ducks’ beaks are about one degree short of being instruments of physical damage. At least, where my fingers are concerned. It’s so nice sitting on the bench by the retention pond with the ducks. Not that ducks don’t have their drawbacks, of course. They tend to play their iPods too loud and when they try to sing along it’s pretty noisome. Very few ducks can actually carry a tune, and the ones who can tend to be drowned out by the ones who can’t. This is probably one good reason you find so few ducks singing at the Met any more. Of course, things being what they are, there aren’t that many ducks who can afford a good vocal coach. And even those who can discover that there just aren’t many good roles written for ducks any more. Wagner, of course, was the exception to that rule and created the “Ring” cycle for an entire cast of ducks. Biggest problem wasn’t with their singing, which tended to be slightly off-key and difficult to understand (they tend to gargle their words). It was costuming. Duck bodies just aren’t made for heavy armor and breast plates (that very term makes them extremely nervous) and when it came time for the chorus to come flying in for the ride of the Valkyries you simply cannot appreciate the pandemonium that ensued. They’d get airborne for a few seconds and then they’d crash land. Then they’d run a few feet and leap into the air and fly a few feet and tumble back onto the stage. I mean, can you imagine 88 ducks doing this all at the same time? (Wagner had a tendency to over-estimate the size of his choruses, especially when it came to ducks). In later years he found it far more profitable (and easier on his nerves) writing for fat ladies in Viking helmets and pigtails, and that pretty much signaled the end of ducks in opera. Although digging, painting, planting, and building are definitely staples of life here at the Lizard Lounge, occasional field trips with the intent to explore one of the numerous attractions offered in Central Florida make for a nice respite from chores (even though those chores come with a certain reward). 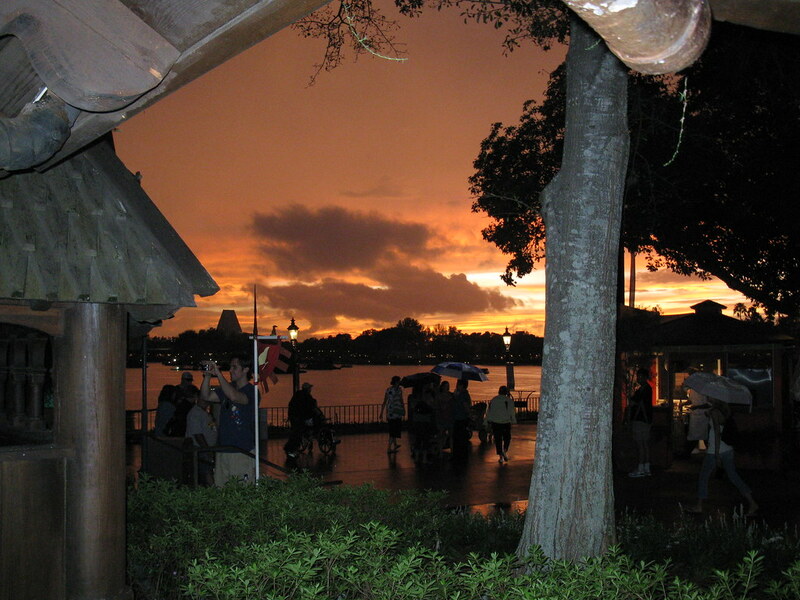 Such was the evening George and I recently spent at the 2009 Epcot® International Food & Wine Festival, an annual offering of the Walt Disney World® Resort. A staple of the Epcot® fall season for the past 13 years, the festival features a park chock full of eats and drinks as well as opportunities for shopping and “info-tainment” centered around the food and wine theme, such as wine tastings and presentations by celebrity and master chefs and sommeliers. The festival also features a nightly concert series, cleverly called the “Eat to the Beat!” Concert Series. As in previous years, this year’s series features a diverse lineup of musical acts, including Starship, Boyz II Men, and Sister Sledge. The evening George and I were there, we (briefly) enjoyed the music of pop/jazz group, Spyro Gyro. Despite his prep school figure, George is a ravenous eater, definitely the ideal guest for an event such as the Food & Wine Festival. 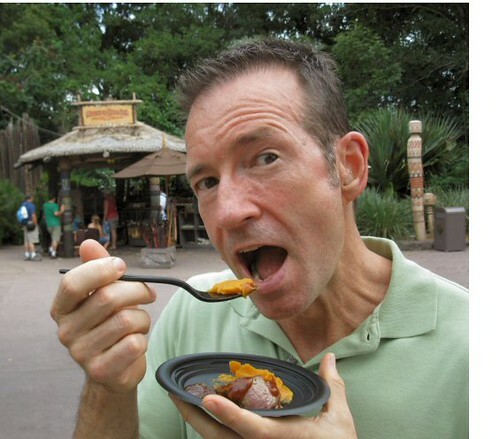 Following his nose for ferreting out morsels of culinary heaven, he and I noshed our way around the World Showcase lagoon, stopping every few feet or so to sample appetizer-sized portions of tasty treats and beverages from dozens of individual kiosks showcasing a planet’s worth of international cuisine. In addition to the 11 countries with permanent pavilions in the park, the festival imports unique offerings from non-represented countries such as Brazil, South Africa and Australia. We had Seared Beef Tenderloin with Sweet Potato Purée and Mango Barbecue Sauce from the Cape Town, South Africa kiosk; Grilled Lamb Chop in a Red Wine Sauce from the Melbourne, Australia kiosk; Maple Glazed Salmon with Lentil Salad from the Montreal, Canada kiosk (just me); and Crème Brûlée au Chocolat au Lait from the Paris, France kiosk (just George). Of course, each of these dishes was paired with an appropriate beverage selection. Every year, we experience a treat so sumptuous that George literally drags me back around the promenade for a repeat helping. Such was the case with the Warm Chocolate Lava Cake with a Bailey’s Ganache from the Cork, Ireland kiosk. Picture, if you will, an individual chocolate cake with a gooey chocolate center, plated and smothered in a rich, chocolate sauce spiked with Bailey’s Irish Cream. (I’m picturing it right now.) Trust me when I tell you it was magically delicious. Of course, by the time we made the 1.3 mile trip back around the World Showcase promenade to the Cork kiosk (and stopped to window shop in the Mitsukoshi Department Store for Bonsai trees, another of George’s consumer weaknesses) all of our indulgences had caught up with us, so we just stood and winsomely watched ladle after ladle of ganache being drizzled over chocolatey lava cakes and ended up settling for coffee in Norway, ending our evening out watching the sun set over the lake. Yep – we’ll definitely do that again next year. Making friends when I move to a new location is never easy for me. I’m fairly reserved and sometimes slow to dive into a new friendship. 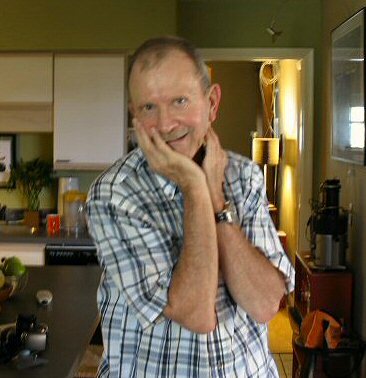 (My grandfther would say I’m “curious”.) However, one of the first people I met when I moved to Central Florida gave me none of that “new-friend apprehension” and has become one of my most treasured friends. George has a much more interesting past than me. 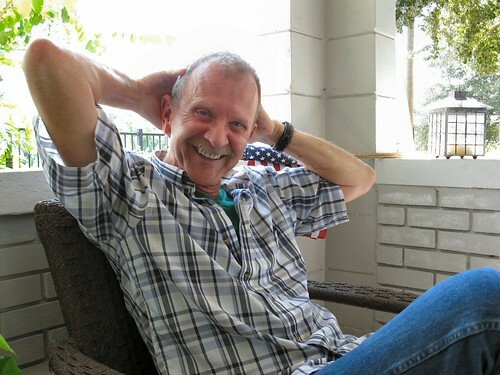 He’s seen lots of now famous Broadway shows during their original runs, played banjo in a touring combo that performed in Vegas (he had a Mike Brady afro at the time), and was an officer in the local county prison (no afro for that one) – and this is just a random sampling. He’s definitely had a panoplied career past. Just got back from Target where, while attempting to reach a pack of red tapers at the very back of the very top shelf, I and my elbow set off a domino-type chain reaction that resulted in several dozen packages of candles falling one against the other, some ending up on the floor, others merely making mad candle-noises on the shelf. Quelle embarrassment. I tried to pretend I was with somebody else, but there was nobody else around. Then I tried that Hiro Nakamura thing from Heroes, closing my eyes and squinching up my face, figuring maybe I could go back in time a couple of minutes, but I overhead a lady-passing-by say to her friend, “Is he taking a dump in those candles?” so I just hollered “Waxy build-up in aisle 33, who’s responding?” and got the heck out.